From The Morgue : Experiment have seen linkys!!!!!!!!!!! Happy April Fools Holy Thursday linky. I was all keen to do an April Fools Pantheon of Plastic entry, following DavidR’s suggestion, but after far too long clicking through action figure custom galleries and flipping the pages of Tomart’s Encyclopedia & Price Guide to Action Figure Collectibles, I still hadn’t found any photos that felt like they could play. No doubt I’ll have a great idea as soon as I post this, but oh well. 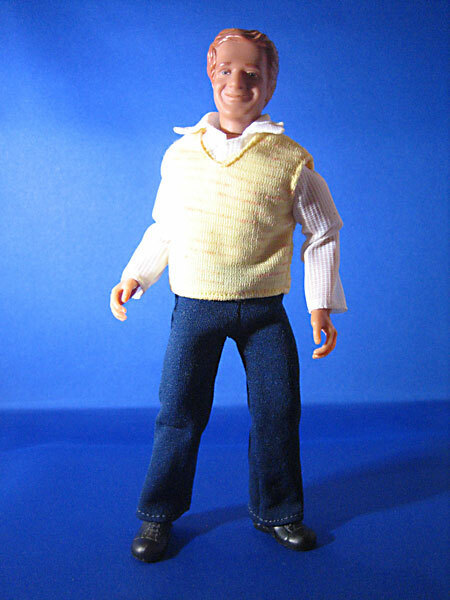 I did find this great action figure of DavidR though. To continue the action figure theme, via DavidR’s gene-brother HamishR, here are 20 action figures with unusual careers. Also, the ten most baffling action figure accessories. Flatlander pointed at this interview and response with a young right-wing politico on the subject of Earth hour. It is hilarious, and we should all seize the rhetorical flourishes on display for future use. Everyone likes “I think my argument is so powerful that it’s not necessary to talk about it” but I am fond of “it fails on three fun-loving levels”, which must be an actual talking point for him because he repeats it in both interviews. Outstanding. The Large Hadron Collider hasn’t destroyed the universe yet, but it did give us a Tweet that will be remembered long after Twitter has faded away. From Rodger: Polka Face! Wunnerful. Seen the Scarface School Play yet? As a hoax it was never gonna last more than five minutes, but as a piece of wacko guerilla pop-art, it’s something amazing. Weird, the Weird Al biopic. Am I the only one who genuinely would love to see a Weird Al biopic? A doco would beeven better. It’s back in the circuit because it’s just been made available, free, under a Copyleft license. An interview with Paley at CBR tells the fascinating story. And you can watch the film here. I haven’t, yet, but I will, because it looks AMAZING. And now I can put that Cerebus issue away! Posted by morgue on Thursday, April 1, 2010, at 9:46 am. Filed under Friday Linky. Tagged comics, fridaylinky, nz comics, US politics. Follow any responses to this post with its comments RSS feed. Both comments and trackbacks are currently closed. Yes, “fails on three fun-loving levels” is one of those phrases that will surely achieve catchphrase status. I am, for example, pretty confident that none of my software tests will ever merely “fail” again. And watch for Rodney Hide to use it ironically to show what a good-humoured and self-deprecating chap he is.